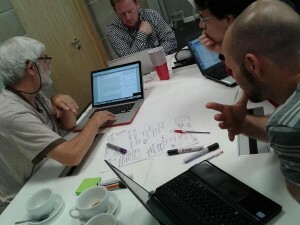 At DNAdigest we run approximately four public engagement events per year in the form of symposia, hackdays or workshops. See for example our Wikipedia Editathon we organised in London in the summer of 2014 or our 2015 Symposium. For each of these one-day events we welcome sponsorships from organisations and industry. – visibility for a very engaged audience from the genomic research community. 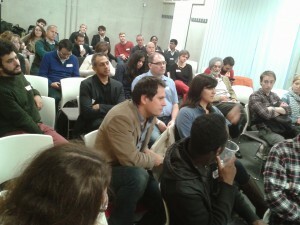 Our events are regularly oversubscribed, and the audience feedback is very positive. An opportunity to support the work of DNAdiget throughout the year. Please get in touch to learn more. For each event we can accommodate up to 3 regular sponsors. As a regular sponsor we will include your logo and company description on all online materials and advertising relating to the event. Your name will appear in posts and tweets when we promote the event on social media and we will mention all sponsors by name at the intro and summary presentations at the event. You can choose a gold sponsorship for our whole day events, where your company name will additionally be associated with the catered lunch. Additionally where possible, we aim to offer a speaker slot for gold sponsors. On occasion and upon enquiry, we offer superstar sponsorship which will make your company the only sponsor of the event and your company name associated with all online and offline materials produced for the event. If you have an interest in sponsoring a future event with DNAdigest please contact us to hear more. The DNAdigest news blog features both blog articles, interviews and news about upcoming events. We do allow sponsored blog posts if your content fits our values and our target audience. If you would like to promote your company or services through a blog post on DNAdigest please send us your draft or suggestion for content and ask for a quote. All blog posts on the DNAdigest blog are circulated in our weekly newsletter and promoted on our social media. Our weekly newsletter features blog articles and news and when relevant we also post links to job postings and events. We do not charge for event postings for academic and not-for-profit institutions. If you would like to promote your industry event via our community, please get in touch to discuss the options.